1/ Rattan Cane Solok Daybed: My position statement on daybeds remains strong, primarily in dreams of naps and long, lounging rests. Daybeds are a great sofa alternative, and also a fantastic functional piece for when you actually do need an extra bed for guests, or an extra place to rest your own self. And…not for nothing, especially ones like this are just beautiful places waiting to be piled with pillows and collapsed upon. 2/ Tiered Rattan Pendant: I would place woven fixtures very carefully. They don’t work in all contexts. This guy, he does work very well in many contexts. Something about the black, and the layers. He’s seriously fun, and works well coupled with many other styles! 3/ Large Black and Natural Seagrass Calista Tote Basket: Functional, and affordable. Think mudroom shoes and toy organization, piles of throw blankets, or towels rolled in a bathroom. 4/ Spun Jute Circle Rug 6′: Jute rugs are always a favorite. Spin them in a six-foot circle and alternate natural and black, and yes, you have all my love! 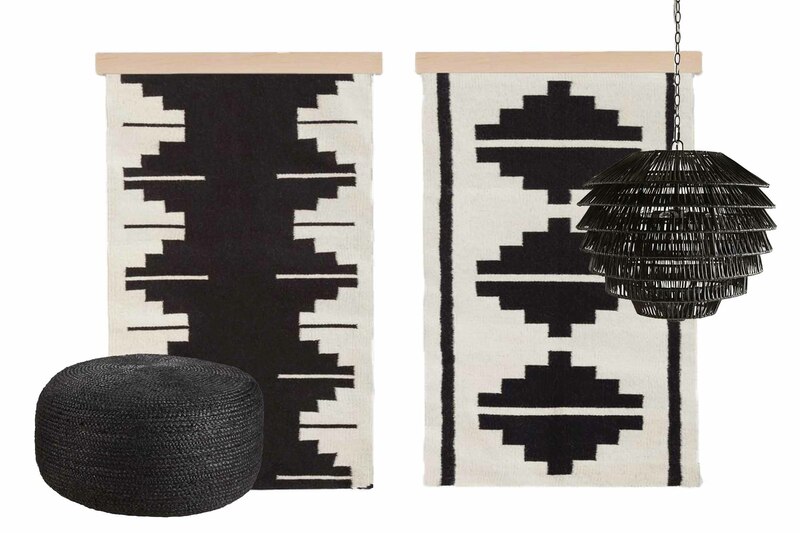 5/ Rug Wall Hanging – Black & White | Set of 2 – The Citizenry: Handwoven in Mexico by the women of Oaxaca. Set of two Zapotec textiles. A perfect way to fill a large space with love, and to feel good about it! Handwoven by a cooperative of 60 women weavers in Oaxaca. Each one takes about a week to complete — all made start-to-finish in a fair trade environment. 6/ Large Black Braided Jute Pouf: And pouf, there it is. In black. And therefore better. 7/ Noelie Rattan Lounge Chair with Cushion: Let’s just bring the spirit of the outdoors indoors, yes? This guy has gorgeous lines and great coloring. He pairs well with an over-upholstered room to give it some breathing space. And he partners well. So there’s that. 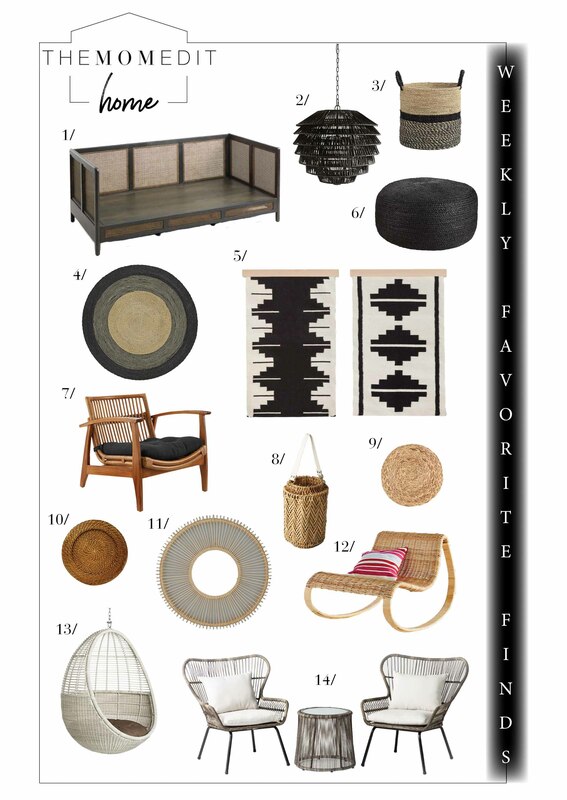 8/ Rattan Lantern: Easy ways to manage a trend you aren’t sure about? Small seasonal pieces. Who doesn’t need a few more lanterns to light up their long summer nights? 9/ Natural Fiber Round Placemat Set of 4: I grew up with these. I have these. We all still throw these. Often in layers. I love them on top of other woven mats, or tablecloths. They never get old and are always beautiful! And I hose mine off, indoors and out, and they dry just fine given some air. 10/ Harvest Rattan Round Charger Plate Set of 4: Another great easy piece, a charger rather than a placemat, so that you can work both in, or layer all three? Classic, timeless and beautiful! 11/ Large Rattan Mirror: This is fun if well-placed. It’s large, but light. And therefore beautiful! 12/ Rattan Rocking Chair: If this were a wish list, and someone told me I could put anything on it, but only one thing, it’d be this for sure. In fact, I just rethought my entire patio around a collection of them. Stay tuned for that on a long hot summer day. 13/ Pod hanging chair with cushion: Margo has one on the porch of her lake house, and we all LOVE it. My six-year-old has one in her bedroom, and it is absolutely her happy place. No regrets on these. They hang well, swing well, are super-comfortable even with many people piled in them, and they are also just plain fun! 14/ Latigo 3pc Rattan Patio Chat Set – Brown – Opalhouse: Additional patio considerations…the conversation set. The well-designed, comfortable, good looking, affordable conversation set. Because what more is there to a patio than conversations really?